President-elect Donald Trump is considering Marine Gen. John Kelly as head of Homeland Security or secretary of state. That’s significant because Trump became interested in Kelly after hearing about his hawkish views on the Mexican border, The Washington Times reports. What caught Trump’s attention was Kelly’s testimony to the Senate Armed Services Committee in 2015, when he warned that smuggling routes along the border are vulnerable to terrorists and weapons of mass destruction. “In my opinion, the relative ease with which human smugglers moved tens of thousands of people to our nation’s doorstep also serves as another warning sign: These smuggling routes are a potential vulnerability to our homeland,” Kelly said at the time. 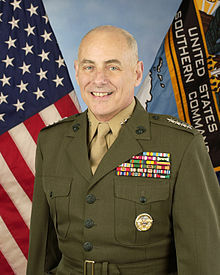 Kelly is a four-star general who has been endorsed by fellow retired Marine Gen. James Mattis.